Made exclusively from wild siberian chaga mushroom. Clinical studies had been conducted in 1950s in USSR and had proved positive influence of chaga on cancer patients even in its terminal stages. 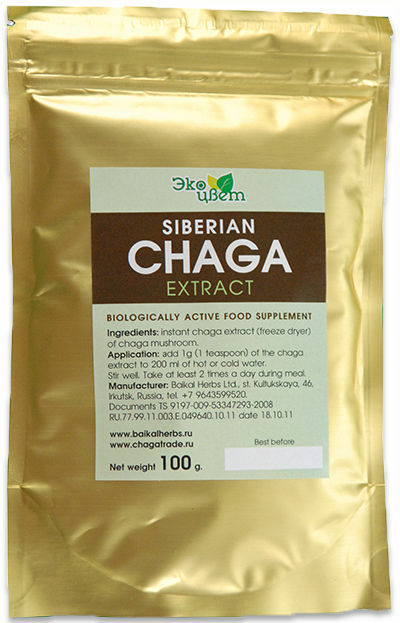 Siberian chaga mushroom is one of the most powerful antioxidants found in nature. This means that chaga has ability to kill free radicals which play major role in the process of your aging as well as in developing of cancerous and other health disorders. Free radicals are damaging your body cells thus bringing on nasty desseases including cancer and diabetes. Antioxidants remove free radicals and prevent cell damaging. So it is obvious that antioxidants are crucial for your health. Chaga extract is a great source of antioxidants which could prevent cancer, slow down the growth of tumors, prevent such diseases like gastritis, ulcers, diabetes and boost your immune system. Regular consumption of antioxidants leads to whole body rejuvenation too. In the recent years even traditional doctors have began recommending the usage of chaga extract to patients with diabetes and weak immune system. · Doesn't contain any additives, alcohol or preservatives ( as opposed to many tinctures, syrups, tablets). · Ready for use products, takes no time for preparation. · Contains more than 57% of chromogenic complex. · Contains more than 50% of polysaharrides. · Contains more than 33% of Beta-D-Glucans. · Made exclusively from wild siberian chaga mushroom. 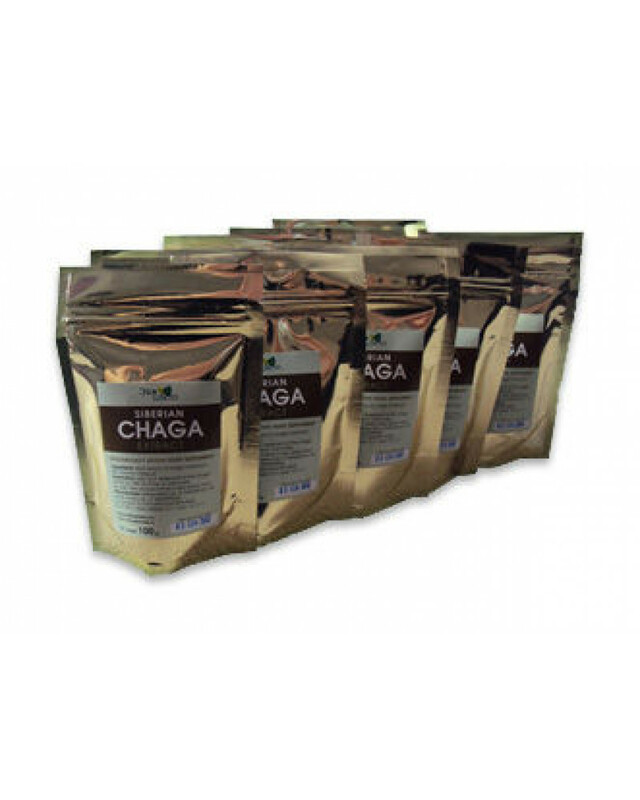 As you may know, the main health supportive feature of chaga mushroom is its incredibly high level of antioxidants. Antioxidants destroy free radicals which are constantly bombarding your cells's molecules trying to incure the damage by ripping off an electron from it. When the damage is done the molecule itself is becoming a free radical and starts to chase the next molecule in the cell in order to tear away its electron. Thus the chain reaction goes on making more and more damages to the cell and eventually will result in early aging and diseases. The molecule of the antioxidant behaves differently from the usual molecule. When it is being attacked by free radical it gives away its own electron but is not becoming a free radical. Thus it stops the chain reaction in its track. However, even if you take a lot of antioxidants the process of scavenging and rehabilitation is not happening fast. Your body has been accumulating free radicals for years. And despite the fact that chaga extract starts the cleansing process from the very first drink, in order to dismantle piles of toxins and getting rid of free radicals it needs time. Usually it takes weeks, months or even years, depending on your state of health and current life style. However, according to some feedback from our customers we have noticed that considerable effect has been registered by almost all of them within the period of time from 6 to 10 months of chaga extract consumption. 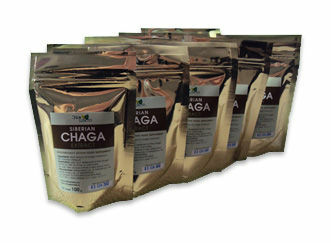 Therefore, for those who regularly drinks chaga, positive changes in their body seem to be inevitable within one year. Of course it doesn't mean that you won't feel any positive signals earlier. Certain positive changes are coming already within the first week of chaga extract consumption, especially for those suffering from constipation or problems with stomach (gastritis). Moreover, during the chaga treatment you should carefully listen to your body, perceive all changes that might be happening to you since you had started taking chaga. In other words, your stomach may stop bothering you even if your primary goal was to enhace your host defences. Also, many people noticed that their appearance has also changed: they become looking younger, and this fact comes so dramatic and unexpected that at the beginning people refuse to believe.. But this is how the chaga works - there is no doubt about that. Rejuvenation is happening in accordance with the laws of nature - chaga antioxidants and huge amount of melanin prevent your cells from oxidation process which is the main cause why you look older every passing year. 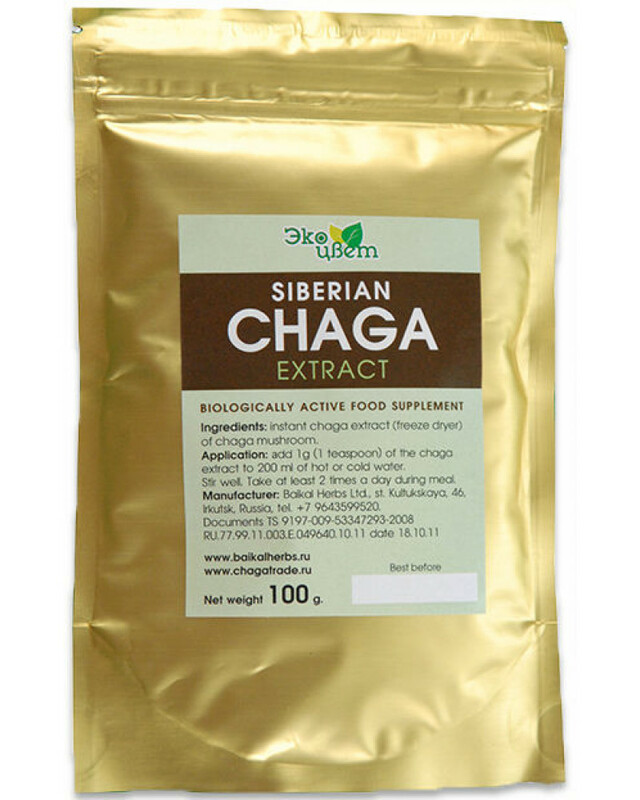 Therefore we highly recommend to order minimum 1 kg of chaga extract. It will allow you to keep using it without breaking the course for the whole year, which is very important in chaga treatment. Packaging: 10 x 100g sealable bags. ½ teaspoon of chaga extract dilute in 200ml of warm or hot water. Stir well until solved. Add honey or sugar to taste. Take 2 times a day before meal. · After the opening of the package, it would be better to place the chaga extract powder into another dry container with a cover. In doing so, you would secure the powder from moisture. It is ok to store the extract in a refrigerator. 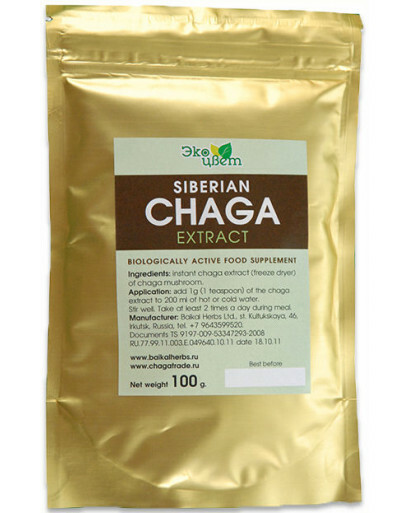 · Chaga extract is hygroscopic - use only clean and dry teaspoon. Moreover, you should not put the teaspoon with powder into the water - first the chaga powder should be poured off the teaspoon into the water and only after that, it is ok to stir. Otherwise, the powder will stick to the spoon.